You might just as well know on the front end, I’ve played this Dan Maples signature course a dozen times and it’s one of my favorites. No biased review here! First, the numbers on this Par 72 masterpiece. The Blue Tees are a challenging 6722 yards at 133/72.4. At 6300 yards and 129/70.3 the White Tees will give you all the game you want. The Gold Tees at 5800 yards rate 120/68.3 and 133/74.1 for the ladies. The Red Tees rate 118/67.7 at 4981 yards. Golf For Women ranked Willbrook in the 2004 Top 50 Best Courses. However, there is so much more to Willbrook Plantation than the numbers and accolades. The natural beauty of the golf course from its Spanish Moss draped Louisiana Oaks to the Lowcountry wetlands is something to enjoy. Coupled with the natural beauty and wildlife there are numerous historical markers that line the course. Each shares the rich history of the two plantations that once stood where the golf course is now. 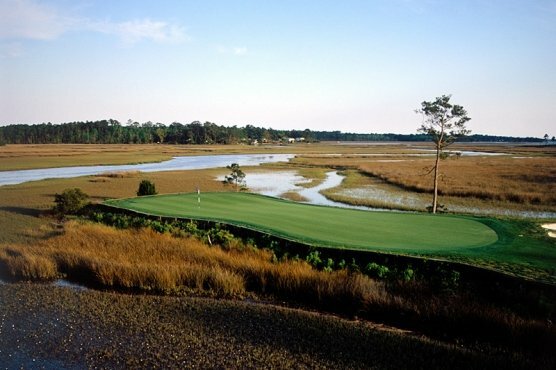 This golf course is set in one of the nicest neighborhoods in Pawleys Island. The homes are absolutely spectacular. With just a few exceptions the houses are set well back from the course and simply add to the eye candy this setting offers. From the bag drop to the snack bar the hospitality of the staff has always been impressive. It’s a very natural, welcoming feeling without any “made for the customer” Southern Hospitality. Make sure you stop at the clubhouse after the round. They have some great looking logo merchandise for both men and women. The driving range is fairly small, but accommodating. If you plan to hit some balls, do arrive well in advance of your tee time. The driving range is a nice walk or ride from the clubhouse and passes a chipping green. However, the putting green is on the far side of the clubhouse on the way to the first tee. Allow yourself plenty of time to hit some balls and get back to the starter ready to go. By the way did I mention there is an absolutely marvelous golf course at Willbrook Plantation? It’s easy to get caught in the natural beauty and setting of this golf course, but that’s part of the challenge. The golf course is very playable and generally what you see is what you get. However, like any good course and especially Willbrook you’ll need to see the hole from the green to tee. The Champions Bermuda greens are large and have their fair share of undulation. Large well maintained sand hazards protect the greens and Sunday pin positions will challenge golfers at all levels. Well-placed drives are critical, if you expect approach shots that take the hazards out of play. Dan Maples has always considered Willbrook Plantation one of his best designs. The architect’s use of well placed fairway bunkers and the natural wetlands and forests of the South Carolina Lowcountry show off his genius. The Par 5 15thhole is a great representation of his creativity. A large oak protects the left side of the fairway. Horizontal wetlands can catch the really big hitter’s drive, but present a carry challenge for the average player. Fairway traps protect the left side of the fairway and forest protects the right. An elevated green with sand hazards in the front earn this hole its No. 1 Handicap. Be patient though the next two are Par and Birdie opportunities. On the front side the Par 4 No. 1 deserves the No. 2 Handicap. A large Louisiana Oak protects the dogleg right, while wetlands protect the left all the way to the green. Par on this hole is a great start. Regardless of your score though, stay focused. Willbrook Plantation has it all – great scenery, welcoming staff, superb conditioning and a really memorable 18-holes of golf. Put this one on your to do list for sure!